Morning Drive to Dehradun. Transfer to hotel. Half day free for Leisure. Night stay in Dehradun. After breakfast drive to Mussoorie, proceed for sightseeing covering Kempty fall, Gun hill, Company Garden,Mall road etc.Back to Dehradun Night stay in Dehradun. After breakfast, Drive to Ranikhet, 'The Queens Field', transfer to hotel and rest of the day is for a leisurely walks of this gorgeous town of Ranikhet. Night stay in Ranikhet. After breakfast, drive to Almora .Its a beautiful hill station. 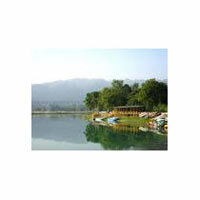 and transfer to hotel and rest of the day .In evening , to explore the unspoiled flora & fauna of this beautiful hill station. Night stay in Almora. After breakfast, drive to Kausani, nature own reserve and idle to spend a quiet holiday in the lap of nature with stunning view of the Himalayan ranges. Afternoon picnic near the River Kosi and day to explore the beauty of nature. Night stay in Kausani.